West Ham manager Manuel Pellegrini has deployed a scout to monitor Javier Jimenez Garcia, a 21-year-old centre-back currently playing for Valencia. 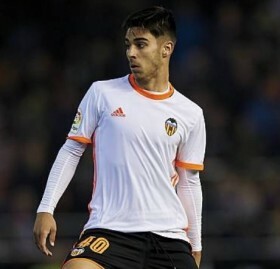 Garcia, who has yet to force his way into Valencia's first-team, has been a regular for the 'B' side. The impressive youngster, born in Aldaia in Spain, signed a five year contract in 2015 and has since gone from strength to strength, forcing his way in to Spain's under-18 side and in more recent times has even had a call up to the substitute's bench for the club. West Ham have been given a transfer kitty of around £30 million to spend on players, but most of their funds will be deployed only after the transfer of Marko Arnautovic to China is wrapped up. It is expected the Austrian forward will leave the Hammers for a transfer fee of close to £32 million. Jimenez has informed his agent that he would like to move to the Premier League and is looking forward to a chance to work with former Real Madrid manager Manuel Pellegrini. The Irons look set to pay a fee of around 7 million euros for the defender, if terms are agreed. Will a transfer deal be pushed through? Visit www.omegatipsters.com to find out.